Many factors contribute to the long-term outlook for the U.S. economy and budget, but in particular, there is a structural mismatch between the amount of revenues that the federal government collects and the amount of spending promised under current law. On the spending side of the budget, there are two major drivers of non-interest spending: America’s demographics and rising healthcare costs. 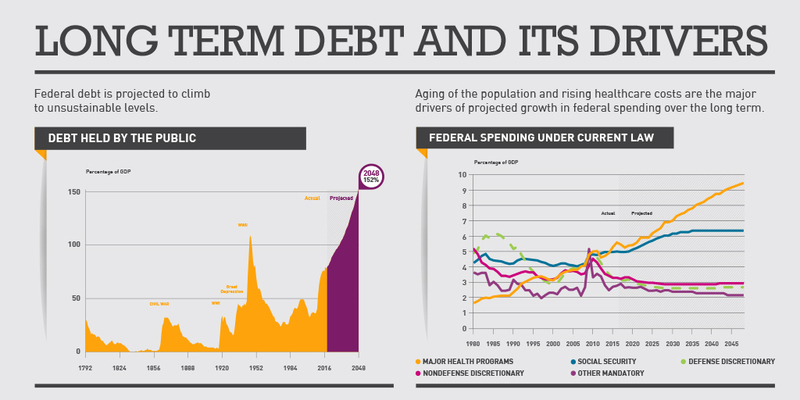 Over the next 25 years, the most significant driver of rising long-term federal spending is the aging of America’s population, as the number of people age 65 or older will increase much faster than the working-age population. This stems from both the aging of the large Baby Boom Generation (those born in the post-World War II period of 1946 to 1964) as well as from increases in life expectancy. Baby boomers: The first wave of baby boomers turned 65 in 2011, and this group will climb by nearly 31 million people over the next 30 years. Meanwhile, the working age population will increase by only 23 million over the same time period, according to the U.S. Census Bureau. Increasing Longevity: Not only will the number of older Americans increase, but they are also expected to live longer in retirement. Overall life expectancy among Americans who live to age 65 has risen significantly over the past several decades. As these aging and longevity trends continue, the number of people age 85 and older is expected to triple over the next 30 years. It is great news that Americans are living longer, and the retirement of the baby boom generation comes as no surprise. However, these trends mean that the government will spend more for programs that serve this growing population of older Americans. In fact, spending on Social Security and the major health programs (which includes Medicare, Medicaid, the Children’s Health Insurance Program, and subsidies to purchase health insurance) accounts for all of the increase in federal non-interest spending relative to the size of the economy over the long term. These demographic trends are already putting pressure on the federal budget, threatening the sustainability of vital programs benefitting older and vulnerable Americans. The second major driver of America’s long-term fiscal challenges is our inefficient healthcare system. America has one of the most wasteful healthcare systems among advanced nations. Combined with the demographic realities of a rapidly growing elderly population, America’s healthcare system leaves us with an unsustainable fiscal future. Not only will more Americans qualify for federal healthcare programs like Medicare and Medicaid, in the coming years, but older people, on average, need more healthcare. Consequently, without reform, the federal budget will bear rapidly growing healthcare bills. The United States spends $3.5 trillion — or 18 percent of the national economy — on healthcare. On a per capita basis, our healthcare system is the most expensive among advanced nations. Yet, America’s health outcomes are generally no better than those of our peers, and in some cases are worse, including in areas like life expectancy, infant mortality, asthma, and diabetes. Put simply, we are paying more than other countries, but we aren’t seeing better results. Healthcare experts have estimated that 30 percent of our total healthcare spending goes to unnecessary, ineffective, inefficient, overpriced, and wasteful services. And healthcare spending is projected to keep rising — faster than inflation, wages, or the overall economy. Not only does the system result in health outcomes that are generally no better for patients, but its inefficiency also creates enormous challenges for the U.S. economy and federal government. Consumers historically have not been cost sensitive because their employers and health plans often cover a large share of their costs, and because they lack the information required to assess quality and cost. Employers and insurers often assume a passive role, accepting annual cost increases, and eventually passing these costs on to customers and employees. Providers generally operate under a perverse fee-for-service model in which they are compensated based on the volume of their services, rather than the value of the care they provide. Improvements in technology often make healthcare more expensive rather than cheaper. Under this system, the demands and rewards for quality, efficiency, and price sensitivity are sharply reduced. The growth in healthcare costs per person has slowed in the last few years, but it is uncertain how long this welcome trend will continue. Despite the slowdown, the Centers for Medicare and Medicaid Services projects that total spending for healthcare will climb to 19 percent of gross domestic product (GDP) in 2025. According to the Congressional Budget Office, spending on the major federal healthcare programs will rise from 5.2 percent of GDP in 2019 to 6.8 percent of GDP in 2029 — and then continue climbing to 9.2 percent of GDP in 2048 — an increase of about 75 percent between 2019 and 2048. That’s faster than the growth of any other major category of the budget except net interest on the debt. A strong fiscal foundation can only be obtained by addressing the structural imbalance between revenues and spending – a result of our changing demographics and rising healthcare costs (as well as from interest costs on our growing debt). Understanding these key drivers of the debt is crucial to resolving our fiscal imbalance and improving our fiscal outlook. The basics of the federal budget.